Okay, so remember the curry I wrote about in the last post? Well, it lured me into this fantasy land of warmth, spices and heat. That, combined with okra ready to spoil in the fridge, sparked the dish you’ll see below. It’s my Indianspired Okra. You will love it, promise. It made me think of Fall. The coziness of cider, with the one-two-punch of ethnic entertainment. This also brings me to an important point: Let recipes or chef creations inspire you to explore your own realms of possibilities. 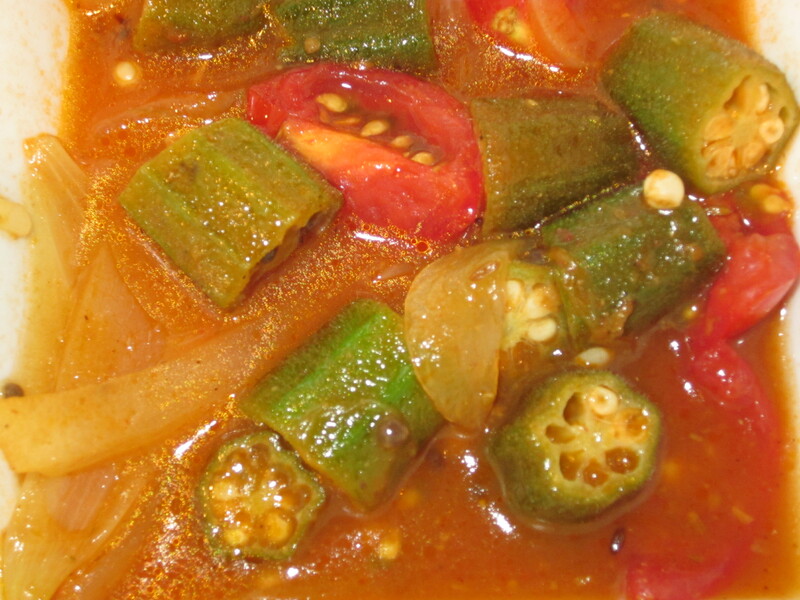 I simply Googled “Indian Okra” and many recipes came up. Number 1, it proved to me that Okra could be an Indian dish (though, I was having a Thai-inspired curry for dinner, but nevertheless, it was about enjoying ethnic food) and number 2, it gave me ideas. That’s what I do. I see how other people do it, mostly how it’s cooked, and then I do my own thing. Don’t let a recipe be a coloring book where going out of the lines leaves you out of the running for the grocery store gift card or whatever prize the coloring contest gets you. Instead, let it be a map. It takes you to a destination that will make you happy. So what if you stop off along the way and enjoy the sights. As long as you get to the land of yumminess, no one will complain. That brings me to tonight’s meal, too. A while ago, my dear friend Carla and I would go to a restaurant and order the “Texas Roll”.. a “sushi” concoction made up of a wrapper of some sort (not seaweed) filled with steak, jalapenos and cream cheese. Oh my gosh. It was like winning a lottery prize, instead this one is easier to digest, or even like fireworks, the kind that require Prilosec. But, the restaurant closed and the meal masterpiece was lost. So, tonight, in a food processor, I combined (hello, recipe!) half a block of cream cheese, with 3 jalapeno peppers (cut in half, seeds removed). A few pulses later, I put the mix in a resealable bag and snipped the corner. Next to a freshly seared sirloin steak, I put a few mounds of the mix and in between I put a few drops of Sriracha. Then, I drizzled soy sauce on the steak. 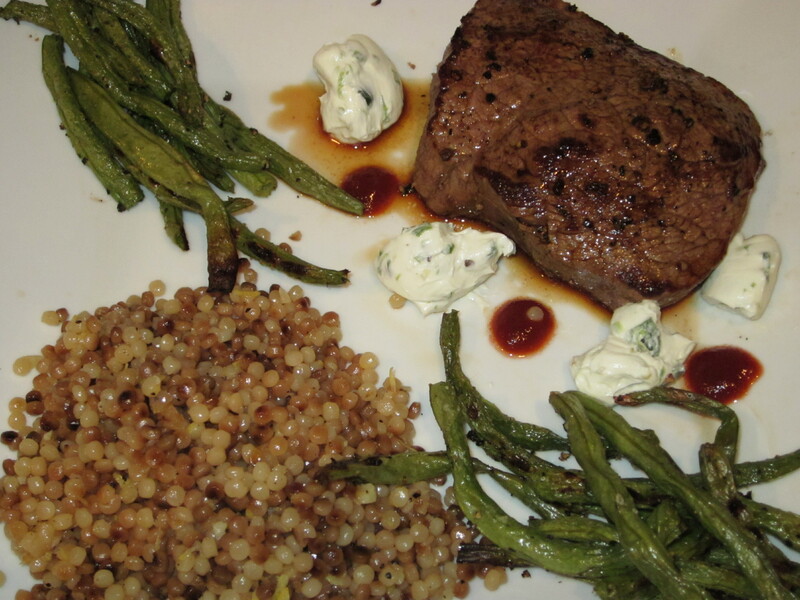 Each bite of steak got a swipe of the cranked-up cream cheese and a dip in the Sriracha. YUM! Toss the steak sauce and try this. It’s creamy, cool and kicks you where it feels good! -1- Toast coriander & cumin seeds in a hot pan (medium heat) for 5 minutes or till fragrant. Don’t burn. Then add to mortar. -2- Add the oil to the hot pan, give it a minute or two to heat-up, then add the mustard seed. They will start popping. Stir and add onion. Stir. Let onion cook for 2 minutes. -3- Using a pestle, crush the cumin and coriander seeds in the mortar until it’s mostly a powder, then add to onion mixture. -4- Add tomato paste to the onion mix, stir. -5- Add okra to the pan, throw in a few pinches of salt, stir. -6- Add juice to the pan and cover immediately. Let mixture cook for 15 minutes. -7- Remove lid, add tomatoes, stir. -8- Separate okra mix to bowls. Should serve 4. -9- Sprinkle each serving with Garam Masala. Enjoy!